David (my son) and I have become very fond of the show Ghost Adventures, which airs every Friday night at 8 pm (CST) on the Travel Channel. In this show, three film makers lock themselves inside a haunted location overnight, then use recording equipment to obtain some kind of evidence on otherworldly events. While the team on Ghost Adventurescan be annoying, they have inspired us to partake in our own ghost hunting. Not overnight and not in very scary places, mind you – I am way too chicken for that. I once visited the House of Torture at Scarborough Faire and was so freaked out, I clung to this strange woman, who in turn clung to me, and we both made it through only because we kept our eyes shut and our mouths screaming. Due to that terror-ific incident, I keep myself FAR away from anything too spooky, including slasher movies and unlit hallways. "Orbs" (either disembodied spirits or dust balls) at the animal loading ramp in the Fort Worth Stockyards. David was pretty excited to have captured what may be evidence from the other side… or evidence of bad air quality. The next weekend or thereabouts, I took David to Boggy Depot State Park just west of Tushka, Oklahoma, and to Fort Washita, west of Durant, Oklahoma, to do some more ghost hunting. 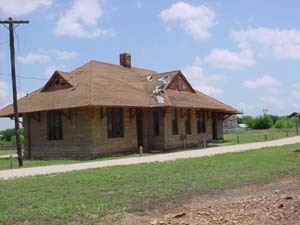 Boggy Depot is now a ghost town, but used to be the seat of the Choctaw Nation, then for a while, the Chickasaw Nation, until the town was abandoned when the railroad bypassed it and the Chickasaw Nation seat moved to Tishomingo. Fort Washita, founded in 1842, served as a supply stop,military depot, was an important camp during the Mexican American War in 1848. I had told David about a strange encounter I once had at the Boggy Depot cemetery, where I had smelled perfume around a headstone, and my camera had gone berserk on me. David wanted to see if he could replicate the experience, or at least find some other kind of unexplainable phenomena. I tacked on a visit to Fort Washita simply because I’ve heard a number of ghost stories about Fort Washita from different people over the years. This child's grave at Boggy Depot is strange... the sandstone tombstone is worn down, so a new stone was placed in front of it. That in itself is not strange. Notice the broken lamp, however. Why's that there? Just below the headstone lie shards of a fairly old, white plate. I could make out the name "Langdon" on it. The name was stenciled on the plate in blue, and then was glazed and fired, so the plate may have been a family heirloom. The deceased boy's last name was Langdon. I don’t quite understand the artifacts. I do respect that each family has their own unique way of mourning, and this may be remnants of their personal grief. The items are interesting and quite mysterious. So, we didn’t find any ghosts, but that doesn’t mean we’ll stop looking. There are a few more places to seek out wandering spirits around here. ..